pop-up blockers: The software uses pop-ups to print certain forms and some PDF reports. You may need to disable pop-up blockers for your ParishSOFT software website. 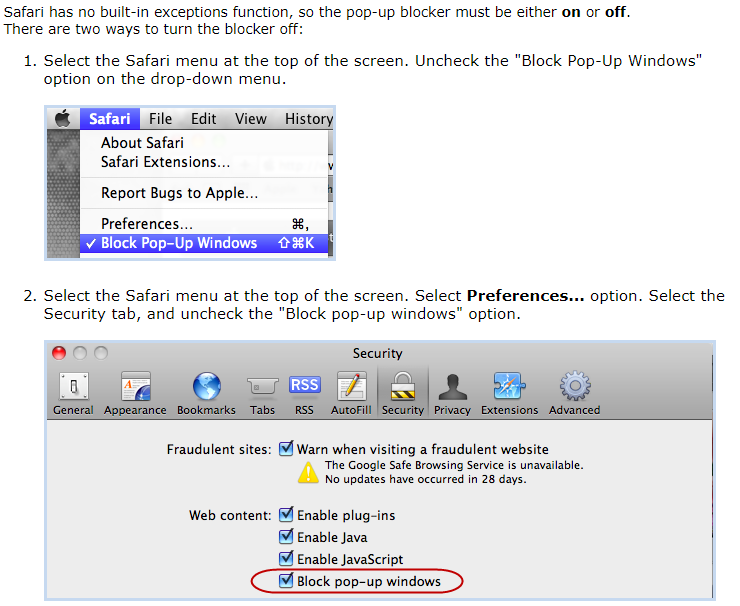 Click on the link below for your browser to learn how to update pop-up blockers. Once you have attempted to view the report, in the address bar, you will see Pop-up blocked . Click it. To always see pop-ups for the site (recommended), select Always allow pop-ups from [site] Done. There are three categories: Blocked (recommended), Block, and Allow. To the right of Allow, click the word ADD. Enter the complete site address (it may be easiest to copy and paste), the click the Add button. When a pop-up is initiated (by clicking the View Report button), Edge prompts you to choose to always allow pop-ups from the site. If you choose always allow, from that point on, your ParishSOFT Pop-Up (such as PDF statements, PDF forms, or checks) will display to your screen. Edge has no built-in exceptions function for you to add exceptions preemptively, so the pop-up blocker must be either on or off. The following instructions will show you how to turn the pop-up blocker off. Note: If your pop-up blocker is turned on in Edge when you attempt to print PDF statements, forms, or checks, they will not be displayed on your screen. Select Settings and More > Settings, and then scroll down and select View advanced settings. Turn Block pop-ups to Off. Pop-ups must be allowed to print certain forms and reports in ParishSOFT software. If you are currently on the site where you attempted to generate the report, look for a message bar at the bottom of the screen which allows you to add a pop-up exception for this site and choose Always Allow. On the Privacy tab, under Pop-up Blocker, make sure the Turn on Pop-up Blocker checkbox is marked, and then select OK.
Next, click on the Settings button to the right of the Turn on Pop-up Blocker box. Add your ParishSOFT Web Site to the exceptions. If you are currently on the site where you attempted to generate the report, look for a message bar at the bottom of the screen which allows you to add a pop-up exception for this site, click Options and select Allow pop-ups for x.parsihsoftfamilysuite.com (where x is your diocese name). Click the three horizontal bars in the upper right corner of your Firefox browser and select Options. Select Privacy & Security; mark Block pop-up windows; click Exceptions. Enter the URL (web address) you use to access the Accounting Site, then click Allow and Save Changes. Since browsers are frequently updated, if the above instructions are not pertinent to your version of Firefox, click the following link to find updated instructions. How to update Popup Blocker Settings.